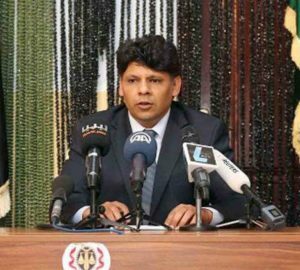 The head of the Investigations Department of the Attorney General’s Office Al-sour revealed details about fuel smuggling operations out of Libya (Photo: Archives Min of Justice). At a press conference yesterday, the head of the Investigations Department of the Attorney General’s Office, Saddik Al-Sour said that the smuggling of Libyan fuel is carried out as part of an organized international network linking Libya and Europe. He confirmed that most of Libya’s fuel smuggling originated from the Zawia oil refinery where Libya’s imported fuel is stored. It is them smuggled from Zuwara, Sabratha and Zawia port. Fuel is smuggled as part of a collaborative effort with the port authorities and those in control of Zawia oil refinery, he explained. Explaining the process, Al-Sour said it is then smuggled from Zawia to Zuwara in two ways: First, through small fishing vessels to larger carriers further out at sea; and secondly through flexible pipes from fuel trucks onshore to small vessels and thereon to larger vessels further out at sea. There was one specific smuggling gang using the pipe method he explained. Al-Sour revealed that local militias guard the smuggler’s fuel trucks in return for anything from LD 5,000 to LD 10,000 per truck. These militias are linked to groups in Malta, Italy, Greece, Lebanon and Turkey. He described the smuggling as systematic, organized criminal activity by local and international criminal smuggling networks of both individuals and companies. The most important of the local smugglers are Fehmi Sleem and his brother Hafed Sleem, aka Al-Idrisi. They controlled the fishing port of Zuwara since 2012. They are behind fuel smuggling operations, explained Al-Sour, using fishing vessels to Malta, then on to Italy, Turkey, Spain and Greece. This is conducted twice a month or about 24 times a year through Maltese smuggling gangs, costing Libya about 300,000 euros each ton of fuel, explained Al-Sour. Al-Sour revealed that there has been ongoing cooperation since October 2017 between the Attorney General’s Office and Italian authorities countering terrorism and Mafia activity based on existing bilateral and international agreements. He particularly highlighted cooperation with Italy on voice recordings obtained that helped in investigations over the last 3 to 4 years.. This cooperation has played a large role in in obtaining information on these operations as organized crime is a cross border activity and Libyan authorities would not have been able to fully investigate it without cross border cooperation, he explained. According to reports by experts, Al-Sour said, smuggling gangs made profits of about LD 1 bn (US$ 770) over the last 3 years. Al-Sour blamed this for the very high demand for foreign exchange, the fall in the Libyan dinar’s exchange rate and the shortage of liquidity within Libya. He said that smuggling activity is the main contributing factor in the economic difficulties suffered by Libyans in the last few years. Al-Sour also pointed out that after 2011 the rate of the establishment of petrol stations had increased by 415 – an increase of 55 percent at a time when there was no economic or commercial rationale for such an increase. In fact, investigations revealed that in reality these petrol stations do not exist. These are ghost petrol stations that exist solely on paper and purely for the purpose of fuel smuggling. Al-Sour revealed that a number of board members of the main fuel distribution companies were implicated in fuel smuggling. He said that 60 arrest warrants and travel bans had been issued against board members. Investigations were ongoing and some of them were being held under temporary arrest, he explained. Al-Sour revealed that despite very poor capabilities, both the Libyan Coast Guard and Libyan Navy were able to stop 11 vessels smuggling fuel. One vessel, Al-Khayam, was recently seized and its crew was sentenced to 6 years imprisonment and a LD 6 million fine.